Gov. Scott Walker signs right-to-work legislation on Monday at Badger Meter in Brown Deer. The measure bans labor contracts that would make it mandatory for workers to pay union fees. Gov. Scott Walker signs Act 1 on Monday, making Wisconsin the 25th state to enact right-to-work legislation. Gov. Scott Walker signs right-to-work legislation on Monday morning at Badger Meter in Brown Deer. The Assembly passed the measure Friday morning following almost 24 hours of debate. The measure bans labor contracts that would make it mandatory for workers to pay union fees. BROWN DEER — Gov. Scott Walker on Monday signed the contentious right-to-work bill at a factory in Brown Deer, making Wisconsin the 25th state with such a law. The state once had a reputation as a strong supporter of union rights. But Walker first curtailed collective bargaining with Act 10 in 2011 and now adds Wisconsin to the list of Midwestern manufacturing hubs like Michigan and Indiana that has backed right-to-work. He was joined by top legislative leaders, including Assembly Speaker Robin Vos, R-Rochester, and Senate Majority Leader Scott Fitzgerald, R-Juneau, whom Walker credited with shepherding the bill through the Legislature in just two weeks. The fast-tracked measure drew thousands of protesters to the state Capitol and was universally opposed by unions and some companies but backed by Wisconsin Manufacturers & Commerce, the state’s largest business lobby. The governor said right-to-work is among the “top three or four” factors that site selectors ask about in deciding where to relocate. Walker said it’s an additional “tool” to help businesses create jobs, along with the state’s manufacturing production tax credit, worker training programs and other strategies. Passing right-to-work “sends a powerful message around the country and around the world” that “Wisconsin is the right place because Wisconsin (is) yet again showing we are open for business,” Walker said. Walker, who is laying the groundwork for a 2016 presidential bid, declined to take questions from reporters after the bill signing. President Barack Obama took the unusual step of issuing a statement on the state legislation. Rich Meeusen, president and CEO of Badger Meter Inc., was a vocal supporter of the measure, which allows workers to opt out of financially supporting private-sector labor unions. Meeusen also is big backer of Republican candidates, donating about $76,000 over the past 10 years to Walker and other GOP candidates, according to the Wisconsin Democracy Campaign database. Meeusen told the crowd that because of the law, known as Act 1, he will be expanding in Brown Deer rather than moving jobs to Nogales, Mexico, where the company has a plant. He pointed to an open space that he said will house $2.5 million in equipment and 12 more jobs, and lead to 30 to 50 more jobs later on. “The equipment is now scheduled to arrive this summer, here in Wisconsin, not in Nogales,” Meeusen said. Badger Meter makes flow measurement and control products, serving water utilities, municipalities and commercial and industrial customers. Republicans have described the bill as offering workers freedom to choose whether to financially support their union. Opponents cite studies showing that wages for all workers in right-to-work states tend to be lower than those without such a law. But two employees taking a break outside the building said workers had been told not to attend the ceremony to avoid “embarrassing” the company. They asked not to be identified for fear of retribution. Meeusen acknowledged that just a “handful” of the plant’s 120 unionized employees had opted out of joining the International Association of Aerospace Workers. Those employees now pay a “fair share” amount to the union to cover the cost of representation but don’t pay for union political activity; under the new law, they won’t even have to pay that amount. Two Brown Deer residents, Vivian and Keith Nienow, came to the ceremony to support right-to-work. They said they were union members in the past and objected to the use of their dues for political candidates and causes they didn’t support. Vivian Nienow said when she was a part-time employee at a grocery store “a good percentage” of her check went for union dues. Nienow said she hopes enacting the law will help encourage job growth in Wisconsin. The pair were invited to the ceremony by their state representative, Dan Knodl, R-Germantown. Wisconsin AFL-CIO president Phil Neuenfeldt noted the closed nature of Monday’s bill signing. Mike Browne, deputy director of the liberal advocacy group One Wisconsin Now, said Badger Meter was a good location for the bill signing. “How fitting that Gov. Walker chose to sign the bill at the business of a millionaire campaign contributor who threatened to send the jobs of hard-working skilled Wisconsin workers to another country unless the system was tilted further in his favor,” Browne said. Reporter Steven Verburg contributed to this report. Gov. Scott Walker says he will sign the bill into law on Monday. Unions talk about ways to prevent erosion of dues. Track the decline in union membership in the United States between 1983 and 2012. The lawsuit is the first to be filed since Gov. 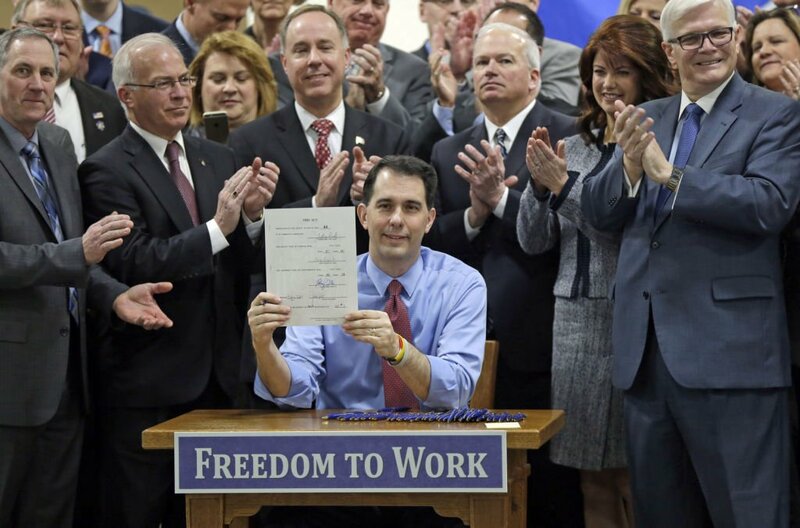 Scott Walker signed the right-to-work law on Monday. The changes could lead to lower costs for public construction projects — and lower wages for the people who work on them. The 2016 GOP presidential candidate wants to get rid of public sector labor unions and create a national right-to-work law. The key questions about Wisconsin's apprenticeship program are who's paying, how much and for what? 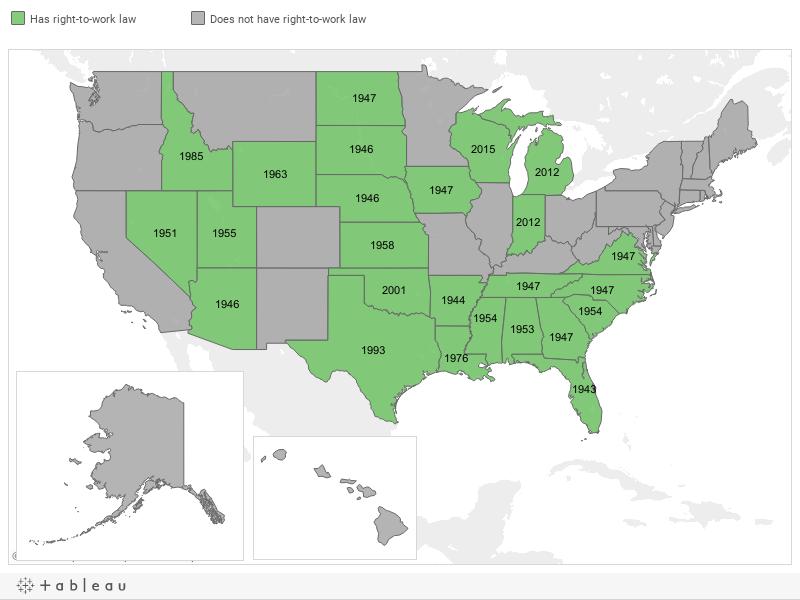 Tap on any state for additional details about when the state adopted its right-to-work law. Freedom to Work from Governor Scott Walker on Vimeo.